Travel lovers are notoriously difficult to buy for! They are often focused on experiences instead of possessions, which is awesome, but it’s also nice to be able to gift them something special every now and again. I love giving thoughtful gifts that provide meaning to a person’s life, that are practical, inspiring, promote self care and overall happiness. This travel gift guide features a wide range of thoughtful present ideas for the holiday season, or any time of the year! I recently found out that Amazon has an entire section of handmade items… how cool it that?! All of Amazon Handmade’s items are genuinely handcrafted and unique. They are made by artisans and small businesses, which is definitely something I can get behind this holiday season! I partnered with Amazon Handmade to include a range of one-of-a-kind handcrafted gift ideas in this travel gift guide. Many of the items can be personalized and customized as well, and some are available for Prime shipping if you are in a time crunch! We are often faced with seemingly unavoidable single-use plastics and waste when traveling… but it doesn’t’ have to be that way! Consider gifting your travel-loving friend or loved one a reusable cutlery and straw set, a reusable travel mug, or a tote bag for on-the-go shopping/groceries. This is a practical gift that will be used over and over again and also reduce our impact on the planet. A world map pin-board is the perfect gift for any travel obsessed friend or loved one. They will be able to document their travels whilst having a unique piece of artwork to display. I love these vintage looking maps, with an unframed and framed option. You could even pick them up some matching pins too, so they can start documenting right away! Travel can be incredibly rewarding, exciting, scary, and life changing. Why not give someone a handmade journal for their next trip so they can document their adventure? I love this classic and unisex world map journal. Another option is gifting a journal cover/sleeve that can also be used to store a passport, journal, tablet, pen, cards, and phone – like this one. It’s no secret that I love the US National Parks… so obviously I want ALL these gifts haha. In my opinion, the coolest of all the park related gift ideas is this register print, which includes a stamp and ink to mark off each park visit. Along a similar theme is this awesome scratch-off National Parks map. Another great idea is a vintage National Park poster, like this one of Yellowstone or this gorgeous one of the Redwoods. Lastly, some good stocking stuffers are these handmade pins, Glacier and Yosemite themed. Travel can often feel a little hectic when you are moving from one place to the next. A handmade and travel friendly self care item is a wonderful gift to show someone how much you appreciate them. This Sleeping Beauty Pillow Spray looks amazing for those jet lag moments. Another option is this solid lotion bar and lip balm set, which is perfectly sized for traveling and we all know lip balm is a must for flights! This men’s beard and soap travel kit is a thoughtful idea for all those travel-loving guys in your life. Overtime Passports can get pretty beat up. I always make sure to keep mine in a cover like the above handmade and personalized one. Another option is a passport organization wallet, where other items such as visas, lounge passes, credit cards, etc. can be kept. Consider gifting a nice ball point pen as well… they always come in handy for filling out immigration forms! Eye masks and travel pillows are a must when flying long distances, and would make for thoughtful gifts. I love the look of this weighted velvet eye mask, which comes in a range of colors and designs. Another unique gift would be this Flight Fillow Sweater to Neck Pillow… you put your sweater inside it for a minimalist travel pillow – genius! A handmade travel themed desk or wall calendar is another wonderful and thoughtful gift idea. I love the van life themed desk calendar featured above, or you could go for something city themed like this beautifully illustrated Soul of the City wall calendar. A more vintage option would be this colorful and retro travel posters calendar by Alan Claude (he also has some gorgeous wall prints). Another unique gift idea is some beautiful wall art that reminds someone of their favorite city, country, or even the outdoors. I love the above Seattle city map print and this beautiful wilderness inspired artwork. You could also gift an art piece featuring their home state/town if they live far away from their roots, like these gorgeous state map drawings. I personally always love being cozy, but especially so when traveling on airplanes and when I take wintery trips. I have been enjoying this handmade alpaca knit beanie and matching alpaca fingerless gloves – and know they would made a great gift! Another cute idea is this incredibly cozy looking chunky merino wool blanket, for those moments of dreaming up adventures from the comfort of their own sofa. For all those photography lovers out there, a camera strap is the perfect handmade gift this holiday season. You can choose from personalized leather straps (like the one above), or patterned and colorful choices. Another photography related gift idea is to give a travel camera insert that can safely hold their camera, lenses and even an iPad or Kindle. These inserts can be placed inside most backpacks and carry-on bags. I personally really dislike when chargers, cables, cords, pens, etc. are floating around in my bag and nothing can be found! I always opt to travel with a smaller zip bag to store all my accessories and miscellaneous items. There are tons of unique options, like this handmade Bon Voyage travel pouch, this stylish leather cord holder, or this cute floral print canvas zip-up bag. An adventure themed mug is a perfect gift for all your outdoor loving friends and family. This unique Off The Grid mug by Black Lantern would made a great gift! Some other options are this Happy Camper Mug and this Retro Mountains Mug. You could even make them a homemade hot chocolate mix to gift alongside the mug! Know someone who loves collecting travel or outdoor themed stickers? These options are all very affordable and make great stocking stuffers! I love this It’s Time For An Adventure sticker, and this Take A Hike sticker is super cute. 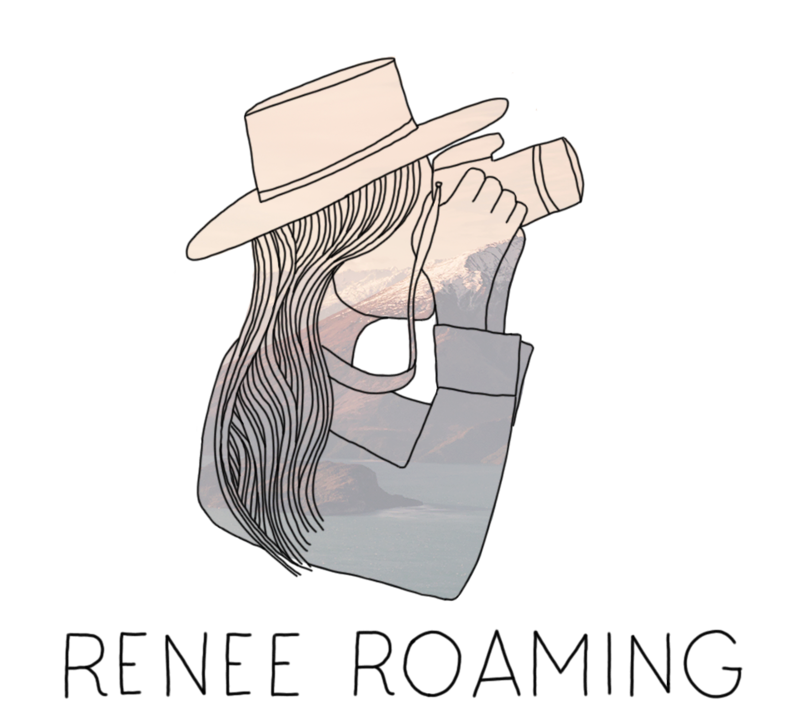 This Explore sticker is more generic for any travel lover, and these illustrated state stickers are perfect for any potential homesick traveler! I hope you enjoyed this travel gift guide and found some unique present ideas for this holiday season! There are so many other amazing, handcrafted gift ideas on Amazon Handmade and I would highly recommend you check them out for one-of-a-kind gifts… there really is something for everyone! Disclaimer – Thank you to Amazon Handmade for collaborating on this travel gift guide. As always, all opinions are my own. This post does contain some affiliate links, which means if you buy something my blog will receive a small commission at no extra cost to you. Thank you for supporting my blog. Plenty of ideas here to buy you for Xmas ?